Bus access to the Hachimantai Aspite Line Snow Corridor! 9:42 a.m. departure – arrives 10:32 a.m. at the summit area. 10:42 a.m. departure – arrives at last stop (Kozan Shiryokan) at 12:04.. get off and wait for the next bus at 12:10, then arrive at the summit at 12:50 p.m.
12:12 a.m. departure – arrives at last stop (Kozan Shiryokan) at 1:30 p.m… get off and wait for the next bus at 1:40 p.m. – then arrive at the summit area at 2:20 p.m.
12:50 p.m. – transfer at the Kozan Shiryokan 1:30 arrival, 1:40 p.m. departure, arriving at Morioka Station at 2:58 p.m.
2:30 p.m. – transfer at the Kozan Shiryokan 3:10 p.m. arrival, 3:15 p.m. departure, arriving at Morioka Station at 4:29 p.m.
3:35 p.m. direct to Morioka Station arriving at 5:28 p.m. The fare is 1,360 yen each way. The Hachimantai Aspite Line is open at last! As of today, the Hachimantai Aspite Line is now open for travel! (But please check the road conditions in the morning before you leave as it closes when conditions are dangerous.) We will announce on the trip8 facebook page every morning around 9 a.m. Japanese time whether the road is open that day or not throughout the snow corridor season. The Aspite Line is a long transit road between Iwate and Akita that will take you to and over the summit of Mt. Hachimantai. A ribbon-cutting ceremony was held this morning to commemorate the event, featuring the city mayor and regional mascots. 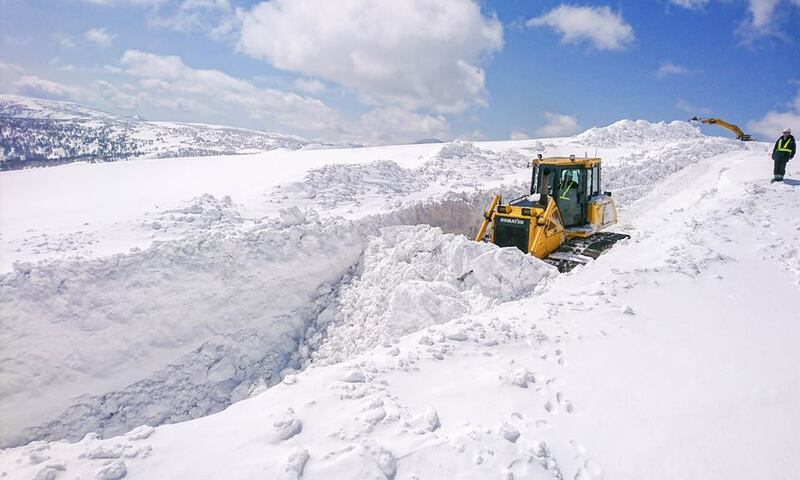 However, while the road is now generally open for the season, there may be some days when it’s closed, primarily due to weather. Unfortunately, today is one of those days! There are two main ways you can check the status of the Aspite Line. There’s an electric sign posted above its entrance that will say whether it’s closed. 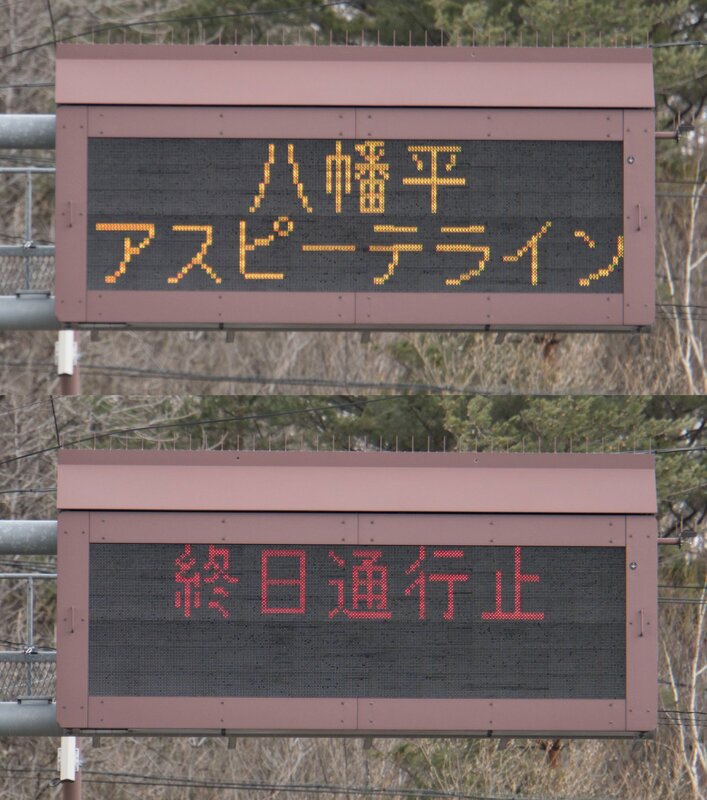 The sign is only in Japanese, but if the message is in red you should check with the nearby Visitor Center! 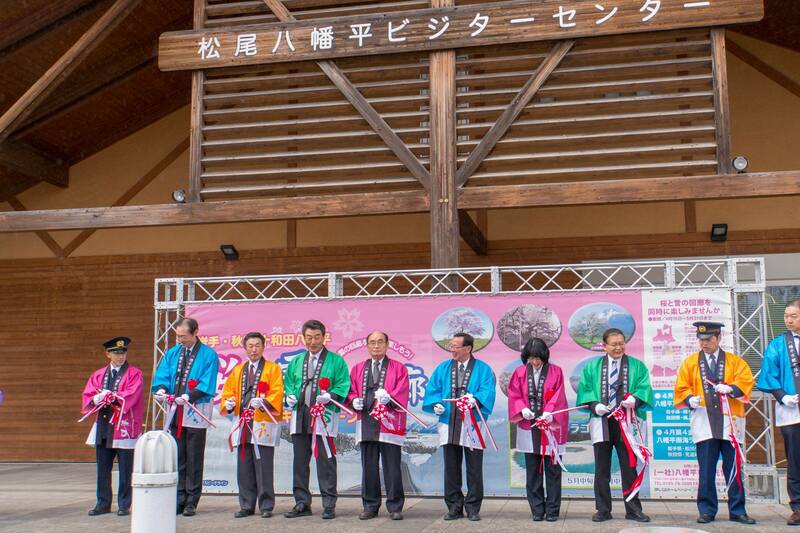 Additionally, you can check the homepage of the Hachimantai Tourism Association. Up-to-date transit information for the Aspite Line is available at the top of the page each day, in both English and Japanese. Look for a blue box! Now you can go out and explore the Local Japanese Restaurants easily! For tourists coming from Taiwan using Hanamaki Airport!! September!! Japanese Autumn Starts From Here!